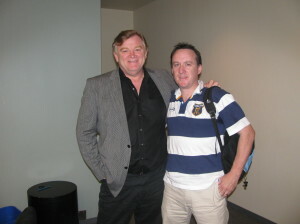 Brendan Gleeson as an actor, is a man of extremes. A man whose talents have proven time and again, that he’s capable of taking on the most difficult role, only to follow it up with one more demanding, daring and distinguished (and in his latest film ‘The Guard’, perhaps deranged, discriminating and devious), than the one before. He’s won awards for roles as diverse as iconic Irish political figure Michael Collins (in 1991’s acclaimed TV movie, ‘The Treaty’), legendary British statesman Winston Churchill (2009’s ‘Into The Storm’), and infamous Dublin gangster Martin Cahill (‘The General’ from 1998). Add to those groundbreaking parts, his continued reputation at the forefront of the Irish black comedy/film noir genre, due to his starring roles and featured parts in ‘I Went Down’, ‘Perrier’s Bounty’, ‘In Bruges’, ‘The Snapper’ and ‘The Butcher Boy’, as well as his scene-stealing performances in Hollywood blockbusters such as ‘Braveheart’, ‘Gangs of New York’ and the ‘Harry Potter’ series, and well, we have on our hands, one of the greatest and most respected Irish actors, dare we say it, of all time. Upon meeting with the affable, soft-spoken Dubliner in midtown Manhattan, there’s little time for nervousness when one thinks of his incredible curriculum vitae. His warmth of character, passion for his craft, devotion to his wife and four sons, love of music and history, and a laugh that would make the crankiest curmudgeon display a more delightful disposition, swiftly become obvious. An accomplished fiddle player, a noted stage actor and writer and a man fiercely proud of his heritage, background and upbringing, he’d almost make you jealous. Until the all-round good-guy persona emerges that is, and well, that’s where the acting takes an intermission. Michael Fitzpatrick (MF): ‘The Guard’ has been well-received all round, how did you enjoy working on the film? Brendan Gleeson (BG): I’d a fantastic time making it. It really was very bad weather, at the worst time of the year in Connemara, but to be working there, you almost become part of the place. In a way that anybody going to the place never does really, unless you’re working there. We’d a fantastic time there, I really have to say. I love working at home anyway, and to have a script like this, and to have the likes of Don Cheadle coming over, it was great, just great fun. MF: Your role, Sergeant Gerry Boyle, did you draw upon any personal experiences for his personality? BG: No! I’d come across these curmudgeonly kind of guys, quite a lot, but there’s a kind of a thing, a kind of a country thing, I think it goes beyond just guards, where people pretend to be just really dumb, and so innocent, because they don’t want to give themselves away! They always want to suss out what’s going on, on the other side. People tend to underestimate them, it’s quite an unusual trick, I think! MF: A strong Irish cast in a successful Irish picture. Seems like a good message for the Irish film industry? BG: Well, I think so, I mean, you know, we just passed two-million in the Irish box office, which is incredible in less than three weeks, which is pretty great. So, it looks like it has an attraction, as they say, and people are getting it, people are having a laugh. The cast is strong, and the writing is great, and John (McDonagh), is just a fantastic writer, and he gets it. I mean, he grew up in London, as you know, then he comes back over Spiddal direction in the summers. It’s that fantastic thing, having the perception from outside and from inside, that works best in terms of just getting us, and being able to have a laugh with it. MF: There’s Fionnuala Flanagan, Dominique McElligott, Liam Cunningham and Pat Shortt, had you worked closely with any of them before? BG: Ah yes, I’d worked with most of them. I think I worked with Liam Cunningham way back in the ’80s with The Passion Machine. Myself and himself, he was just a little bit after me, was he? Maybe a year after me, in terms of going at it full time, or around about the same time, but I’ve worked with him a lot. I think I’ve worked with pretty much everybody at some point along the line! If we get the material, there’s plenty of talent at home, there’s no problem there. MF: Most of the filming was done in County Galway, being a Dubliner, how familiar were you with that part of the country? BG: From my teens I remember going up to Connemara, in fact, when I was about fifteen or sixteen I went over there to see friends of mine from school that were in the Gaeltacht. I hadn’t gone as part of (the Gaeltacht), that’s another story! But I remember going through the rain, and you could hear the pipes, the music. And over there, I gradually got into the traditional music in a big way. So, the west, I go over there all the time, I love it. And I’ve decided I’ll not allow (traditional music) be described as mere ‘diddley idley’! It took me ages to even tell the difference between a jig and a reel, but people don’t really understand how it works. It works inwardly, instead of the way jazz improvises outwards, traditional Irish music works in. All the stitchwork, and variations, and because people don’t understand it, they disparage it. And I was going to go along with that until recently, I was being interviewed by (Irish broadcaster) Dave Fanning, and he said, you know, I’m not going to ask you about music, sure you love all that diddley-idley music. And I said, well to be honest I am, but I also like Ry Cooder and other stuff! And someone said, sure, you didn’t stand up for us! So, I said, you know what, you’re absolutely right, so from this point on, I’ve decided I’m going to stand up for it! Particularly, when the whole country’s bust, we can do things for nothing, and we have traditional music staring at us right in the face. MF: You’ve starred in some memorable Irish black comedies over the years, like ‘The Snapper’, ‘In Bruges’, ‘Perrier’s Bounty’ and ‘I Went Down’. Where does ‘The Guard’ rank alongside those films? BG: Ah, it’s right up there, you know, it just is. I mean, he’s a character to die for, basically, because obviously he’s outrageous, but as well as that, he’s unpredictable. You never quite know what he’s going to do next. So, those characters don’t come along that often. MF: Growing up in Ireland, were there any actors that you particularly looked upon as influences in your decision to join the trade? BG: Well, certainly in terms of my film career, Gabriel Byrne was a huge (influence). He kind of broke the mold a little bit, as far as I was concerned. He did a little bit of teaching, like I did. You know, he came here (the USA), rather than going through London and he never lost sight of himself. I always took great inspiration from him, I felt that if he could do it, and stay true to himself, I thought it was possible to maybe forge a career in this business. That’s not exactly growing up, but it was at a particularly formative time, when I decided to concentrate on film. MF: You were teaching for ten years before becoming a full-time actor? BG: Yes, that’s right. I’d been working for The Passion Machine with Paul Mercier at home, so that had become semi-professional, we weren’t getting paid, towards the end, we might have gotten a few bob. It went from putting things on at the old Saint Francis Xavier Hall, or the SFX Centre as they renamed it! Then we started doing these runs at the Olympia, so I’d gotten to this stage where it was kind of at a professional level, and drawing professional audiences. We packed out the Olympia, what’s that, 1.300 people?, for ten weeks on the trot, so yeah, I was teaching, while I was acting at the same time. I didn’t exactly start from scratch, I was about 34 when I made the leap. MF: So, you were about 34 when you went full-time as an actor? BG: I’d kind of gotten a small bit of a profile (in Dublin), it’s not fair to say that I just jumped in at that point. I’d had a bit of a track record, but the day was too short. I was trying to do a bit of writing, I put on a few plays with The Passion Machine. That was great, writing with the knowledge that it was going to be put on. MF: So you were acting, teaching and writing simultaneously? BG: Yeah, and then directing my own plays, and trying to put on a concert in school, you know, you do whatever you can! I mean, I was quite a conscientious teacher, I never wanted to be a clockwatcher, you know, someone just putting it in. It’s impossible anyway, it’s a rubbish profession if you’re just doing that. I thought I’d never write again, that’s what I thought would happen, if I didn’t (quit teaching). I think one of the reasons I didn’t do it before that, was I didn’t know if I trusted myself not to go to seed waiting for the phone to ring, and all that kind of stuff. But, once I discovered that, once I got myself writing, that I felt okay, that if there were jobs being presented, I could make my own work. Then I thought, I can’t teach and do all this. It’s an odd thing. It’s funny though, once I got out there, I found I didn’t have any time for (anything else) for about twenty years after! MF: How was your family, with your decision to act, were they supportive, or nervous? BG: I was more nervous than (my wife) Mary was, she was like, I’ll go back to work, if need be. In the end she did, and we had the four lads at the time. She was like, I can’t look at you, doing your head in! Then I got my first job at The Abbey, which was great, you know, starting at such a high level. Then I was like, what am I going to do when this run finishes? Mary let me do my own head in, as she went back to work! Then we just started working things out, balancing things. I’ve had great support. MF: And two of your sons are in the business too? BG: Yes, Brian and Domhnall. It’s great, you worry about the morale aspect of what’s going to happen if it doesn’t work out. I’ve no problems with their talent, I know they’re there because they should be there. We’ve good craic working together, which is a big bonus too. Domhnall did a short there, ‘Noreen’, which was shown at Tribeca recently and won the Galway Film Fleadh award last year. Myself and Brian played two cops, we actually shot it directly after ‘The Guard’, and I used the same uniform! It was written before The Guard, believe it or not, but I used the same uniform, and it was great craic working with them. 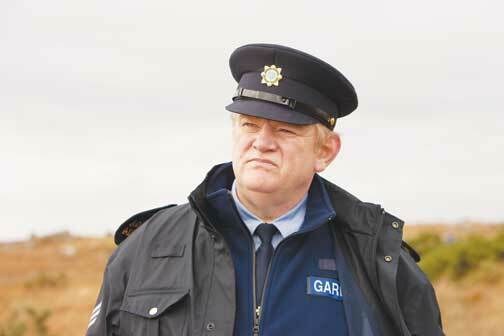 MF: So after The Guard, what’s next for Brendan Gleeson? BG: Well, that’s a good question, I want to try and shoot ‘At Swim Two Birds’ in the spring. The momentum is going that way, I think it is (going ahead) but nobody can say anything’s going to happen, unless you’re actually wrapping, because of the vagaries of this (business). There’s also something else, that’ll happen pretty soon, but, in the same way, I don’t want to jinx it until I’m actually there! And hopefully, I’d like to do ‘Calvary’ with John McDonagh. We had a good chat at one point, I can’t remember where the conversation took place, maybe at Sundance. About a good priest, reviled by his community, in the current climate. He’s written a phenomenal script, so hopefully that’ll (come out) next year.